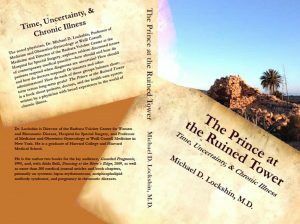 Michael Lockshin’s latest book, The Prince at the Ruined Tower, explores seldom discussed issues of contemporary medical practice—how should and how do patients respond when diagnoses are uncertain? How should and how do doctors respond? Or insurers and other administrators? How do each of these groups balance short-term versus long-term goals? The Prince at the Ruined Tower is a book about patients, doctors, and the health care system written by a physician with broad experience in the world of chronic illness. Dr. Lockshin is a pioneer in solving both the medical and the personal health-care issues that arise for patients with chronic illnesses. He has done his most renowned research on autoimmune illnesses, particularly those that affect women — systemic lupus erythematosus, antiphospholipid antibody syndrome, and pregnancy-related problems of these illnesses. “For a long time my word meant everything. Standing at a bedside, I pronounced a diagnosis. Debate would then end. Medical students gathered round, listening to me pontificate. I spoke sagely (I thought) about my patient’s perhaps rare, certainly interesting, and often difficult diagnosis. The patient, too, might listen, anxiously, as I dictated, to my students and to her, my ideas about her care.Looking back, these long ago bedside scenes are like mini-dramas of stage or television, the leitmotif of which is my certainty.” Click here to read the prologue from The Prince at the Ruined Tower. Available in eBook and paperback editions: Amazon or Barnes & Noble or your local bookstore. Dr. Michael D. Lockshin is one of America’s preeminent experts in the long-term care of chronically ill patients. He is a pioneer in solving health-care issues that arise with the illnesses on which he has done his most renowned research – systemic lupus erythematosus, antiphospholipid antibody syndrome, and other autoimmune diseases which especially afflict women. As part of Hospital for Special Surgery’s 150th anniversary celebration, the Division of Rheumatology honored the thousands of lupus patients, past and present, who have inspired each member of the HSS healthcare team. “Honoring Lupus Heroes” celebrated patients’ wisdom, generosity and invaluable contributions to lupus research and care. From a scientific presentation at the SLE Workshop at the Hospital for Special Surgery: Dr. Lockshin addressed advances in lupus care, diagnosis and treatments by decade, beginning in 1963, the year of his graduation from medical school and continuing into the present. He also presented his thoughts on the future of lupus treatment and research.